So have you heard the buzz around Be Younique 3D lash mascara yet? It's all about adding volume and boy does this system deliver. 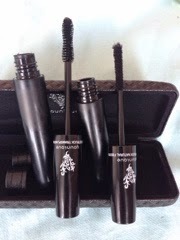 In your little case you get two wands: a mascara and the fibre wand which is the magic adding volume bit. At first it was a bit fiddly using one and then the other and then back to the first but as you get more used to it, the easier it gets. I won't put pictures up of my eyes because they freak me out a bit but if you goggle this product then you will see loads of images and videos showing how to apply and the amazing results. 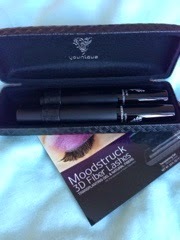 Retailing at £23 it's not the cheapest of mascara a but it's a good priced within its market for what it does. It really does give some impressive lashes and I'm not usually one for wearing mascara but this is brilliant and something I wear on a night out. 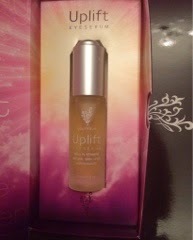 My friend also sent me a sample of the facial oil (I'm slightly worried she is trying to tell me something!). I'm lucky that I haven't really got eye wrinkles yet but what I do have is a cross line on my forehead from to much frowning (or not enough glasses wearing kinda squint). I was assured it would work just as well on this. The oil glides on nicely and you really don't need too much. If you aren't used to oils, don't be scared, it really isn't greasy. It hasn't got rid of my frown line (it's deep so not sure much would) but I think it's made it look a bit softer around the edges so I'm going to keep using it to see how much better it can get.